On Saturday night, when I attended the grand reception of a wedding, I realised something I have suspected for quite some time: I prefer white tie to black tie. I cannot help it. 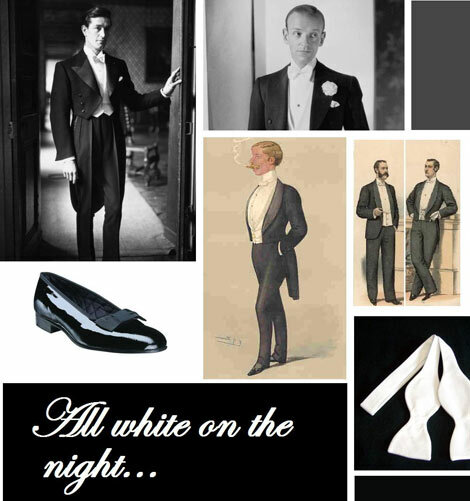 As I was comparing the lines of the gentlemen dressed in tails to those dressed in shorter jackets I couldn’t help but feel that the shorter jackets, though many were well cut, were no match for the breathtaking elegance of an evening tailcoat. The ‘tuxedos’ were sleek and appropriate but they had not the character; whereas the tailcoat was the dashing aristocrat, leaping around the floor with laughing ladies, bearing a ‘taking-it-all-for-granted’ smirk, the shorter jacket was somehow pedestrian in comparison; a dull civil servant who declined the champagne for reasons pertaining to his health. Although the tuxedo is now kingpin, in part due to the fact that formal functions have ceased to require white tie attire, it was rather like seeing a deposed monarch square up to a feeble revolutionary: there was simply no competition. The party invitation had stipulated white or black tie and I applaud such acknowledgment heartily. Keeping the option of tails open at regular social functions keeps it in the here and now and prevents its final relegation to the ‘Costumes of Years Past’ exhibition at the Victoria & Albert. However, although I approve of the ideal of white tie warmly, there are considerations one must have in relation to its use. As there are some stern rules on what to do and not do to in relation to black tie, there are also things to bear in mind when pondering the possibility of black’s patrician cousin. I saw some wonderful tails on Saturday but I also noticed that some of the wearers had mistaken themselves for someone a good deal taller than they when making their purchase. Not only was the length of their ‘tail’ at the back excessive but also, the jacket panels of the tails finished well below the line of their crisp white Marcella waistcoats. The higher up the waist appears, the better the tails look. I believe that evening pumps with a grosgrain bow are far more flattering than Oxfords, considering the silhouette of tails. They’re more youthful and match the daring of the ensemble itself. Oxfords do look fine, as long as they’re slender. There is simply no point in getting the beauty of the tails right if the sole you are wearing is like a tire tread. Whatever shoes you wear, wear patent leather. Everything else looks wrong. One gentleman had bought himself a boiled fronted shirt. Everyone else was wearing the pique cotton version. It was embarrassingly clear that boiled fronted shirts married the style and finesse of tails well. The pique, well ironed, still manage to crease and rumple. My advice? Plump for one of the rarer boiled front shirts. Although I advocate pocket squares in nearly every ensemble, I am not so sure about their use in white tie. They can look a little excessive. Buttonholes look wonderful and should preferably be worn. Previous Post Is the Suit on Borrowed Time?